Dr. Lillian Carson is a nationally renowned authority on child development, parenting and grandparenting. Dr. Carson is the author of The Essential Grandparent, winner of the 1996 Parent's Choice Award. She was McGrandMom for McDonald's, lectures and her television appearances include The Today Show, CBS Evening News, CNN, MSNBC. A psychotherapist in private practice in Los Angeles and Santa Barbara, she has worked with adults, children and families for more than twenty-five years. Dr. Carson lives in Montecito, California with her husband and enjoys grandparenting ten grandchildren. 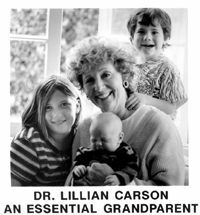 Dr. Lillian Carson is an authority on child development, parenting and grandparenting. She has earned three degrees at UCLA and is a Doctor of Social Work, a Licensed Clinical Social Worker and a Board Certified Diplomate in Clinical Social Work. Her studies and research focus on children, parenting and intergenerational relationships. Her training includes Cedars-Sinai Medical Center, Department of Child Psychiatry in Los Angeles and Hampstead Child-Therapy Clinic, London. As a psychotherapist, her private practice has served adults, children and families in Los Angeles and Santa Barbara for over 25 years. She is a child-care consultant and an advocate for children. In this capacity, she has developed parenting programs and interviewed and worked with countless families. She has been a Field Instructor at UCLA, a board member of numerous organizations serving children and families including: The Santa Barbara Children's Commission, the Editorial Board of the UCLA Working Parents Newsletter, the Advisory Council of Advocates on Behalf of Children, the Advisory Board of the Partnership for the Children of Santa Barbara County and served on the Board of Casa Dorinda and the National Board of Girls Incorporated. Dr. Carson has been the national spokeswoman for the Healthy AgingTM Campaign, sponsored by the United States Postal Service, McGrandMom for the McDonald's publication Parent Source Magazine, national spokesperson for America's Promise, Grandparent Moderator for the United Nations Global Meeting of Generations project and a lecturer. She is currently grandparent spokesperson for Hasbro Toys "My First Games". Her Q&A column "Ask Grand" appears in GRAND Magazine. Her numerous television appearances include The Today Show, CBS Evening News, CNN, MSNBC and CNBC. She is listed in the World's Who's Who In The West and Who's Who of American Women. She lives in Montecito, California with her husband, an architect, and enjoys grandparenting ten grandchildren. "I would never have made it without my grandparents." These words, spoken by many of Dr. Lillian's Carson's patients, left no doubt that grandparents can make an essential difference. They resonated with the power of experience and challenged her to inquire into the nature of a grandparent's impact on grandchildren. They motivate her own grandparenting and provided the catalyst for her books. Dr. Carson is an expert who presents her ideas with clarity and warmth. She is passionate about the role of today's grandparents. Encouraging grandparents, she reminds them, "Grandparents, never doubt it: You are essential!"